St. John’s Evangelical Lutheran Church had its beginnings, together with many of the older Lutheran churches of our land, in the great emigration from Germany that took place in the latter half of the nineteenth century. In Germany, as in most of the countries of Europe, there was opportunity only for the princes and the landholders. But in America, opportunity was unlimited. Vast reaches of land, fertile farms were available to those immigrants, whether native or foreign, who were willing to come into what was then known as the West, and live on the land and cultivate it. The railroad, improved roads, established settlements, the push to the far West inspired by the gold rush of 1849 helped to tame the wilderness, to make it easier to get into the West, and to remove the fear of the unknown which kept many at home. By the hundreds of thousands immigrants poured into the land, and those from Germany resolutely moved into the West, and took their faith with them. Among the vanguard of the German immigration there were the founders of St. John’s Church. They came from Pomerania, in northeast Germany along the Baltic Sea. They were a little band, closely knit by friendship, relationship and by their common faith. Already in Germany they had left the State Church which had become more and more lax in it adherence to the word of God, and affiliated themselves with a Free Lutheran Church. 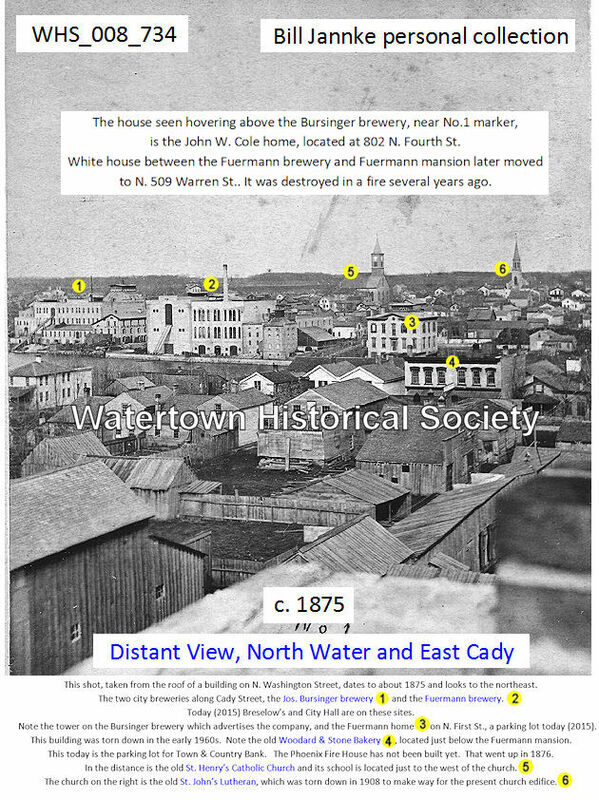 In the summer of 1851 they came to Watertown. Watertown was then a thriving community of 4,000 inhabitants. It was not yet a part of the great railroad network that contributed so much to the opening of the West, but was connected with the nearest railhead, Milwaukee, by a plank road. The journey across the Atlantic took eight weeks, from there they went by rail to Milwaukee, and the final stage of the journey was made by wagon. It is impossible to ascertain exactly the names of the hardy, Godfearing pioneers, who under God, were the founders of St. John’s Church. Among them were, however, the following: Heinrich Kroening, Friedrich Schumacher, Friedrich Klug, Wilhelm Dobbratz, Heinrich Koch, Erdmann Folijahn, Ludwig Mielke, August Schatz, J. G. Gerbig, J. F. Spiegelberg, Caspar Schroeder, Carl Grewe, Wilhem Graunke, Carl Glamm, Christoph Wiedenhoeft, Gottlieb Hicke and Goerge Marquardt. Being devout Lutheran Christians, one of the first cares of this little group was to provide for their own spiritual welfare and that of their families. 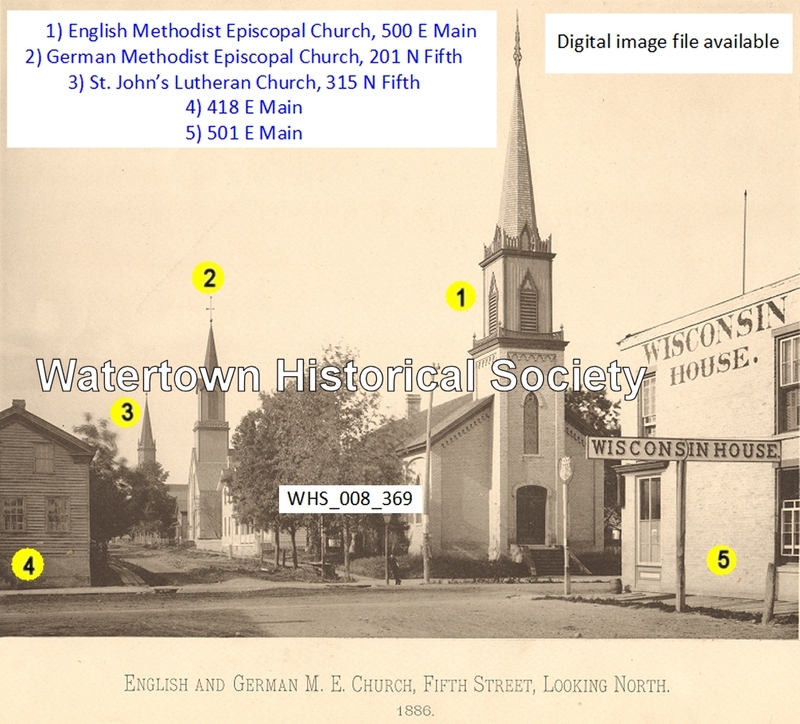 There was in existence in Watertown a congregation composed of German immigrants, served by the Rev. Friedrich Rentzsch, but it required only a little investigation to discover that this congregation was not an orthodox Lutheran group, but taught the same “error” which had moved them to leave the German State Church in their homeland. Unwilling to compromise the true Lutheran faith, and being desirous to establish that church which teaches the word of God in all its truth and purity, and make a beginning free of all compromise, a number of the immigrants, under the leadership of Heinrich Kroenig, and through the cooperation of one of the civic leaders of Watertown, John W. Cole, rented a small public school building at North Fourth and Division Streets. Here this little group of Christians met, and since they had not pastor, one of the members would read a sermon each Sunday from a book of Lutheran sermons prepared and published by a German pastor, Heinrich Mueller. There was, at first, no formal organization, so that actual date of the founding of St. John’s Church is indefinite. But so eager were these devout immigrants to be served by the pure Gospel that according to the best information available these services were instituted a very few months after the arrival of this little band of Lutherans in Watertown, very likely in the fall of 1851. St. John’s Church in Watertown had its beginning in 1852. The first new church building dedication followed on June 25, 1865. Within a year, in 1852, the congregation called its first pastor, the Rev. A. Kleinegees, who lived in Watertown and was a member of the then Ohio Lutheran Synod. He remained with the congregation a very short time, until March of 1853, since it was soon discovered that at the time he believed and taught the liberal and rationalistic doctrines of the German State Church. Obviously, however, Rev. Kleinegees, who was born in Germany on Sep. 15, 1824, must have later reached a different conclusion, since he joined the Missouri Synod in or before 1867, and served parishes of this body in McClure, Ohio, and Pilot Knob, Missouri, where he died of typhoid fever on March 25, 1869. George Marquardt and Gottlieb Hicke were duly elected trustees of the German Evangelical Lutheran St. John’s Church in Watertown, Jefferson County and State of Wisconsin, namely Christoph Weidenhoeft for one year, George Marquardt for two years and Gottlieb Hicke for three years. Being without a pastor, the congregation prevailed upon Rev. L. Geyer, the pastor of Immanuel Church, Town Lebanon, which at that time was a member church of the Missouri Synod, to serve in this capacity. He began to serve the congregation on Nov. 1, 1853, and remained its pastor until Feb. 1, 1855. He was able, however, to provide worship services for the congregation only once a month, the services being held in the school building rented from the city at North Fourth and Division Streets. Into this period belongs also the beginning of St. John’s Parish School. The exact date of it origin cannot be determined, but it is obvious from what is known that one of the first concerns of the founders of St. John’s Church was the Christian education of their children. Already before the pastorate of Rev. Geyer, Heinrich Kroening, and Rev. Kleinegees had served as teachers to the children of the congregation. Now, however, the work of the school was expended, and the children were placed under the instruction of the son of the teacher of Immanuel Church, Lebanon, Mr. Wetzel. It is remarkable, and a reason to glorify God, that in the one hundred years of St. John’s history the needs of its parish school have always been close to the hearts of the members of St. John’s Church, and that its small, difficult beginnings have grown into such a magnificent institution, and that this nursery of Christian education has provided uncounted blessings to thousands of blood-bought souls. In this period St. John’s Church took another important step, which has had far-reaching significance upon its history. In 1854, at the eighth annual convention of what was then known as the Evangelical Lutheran Synod of Missouri, Ohio, and other States, the congregation applied for membership with this body and was received as a member. It is noteworthy that St. John’s congregation is thus one of the oldest member congregations of what has become a world-wide church group. Through its affiliation with this staunchly conservative Lutheran body, St. John’s Church has carried out its duty of preaching the Gospel into all the world, has helped to bring the printed “Word” to thousands of blood-bought souls, has, by it gifts and by sending men and women from its midst, provided pastors and teachers firmly indoctrinated in the Gospel to meet the needs of a constantly growing church body, and has taken an active part in the spreading of the Church of the Reformation into every state of the union, and many of the far corners of the world. Through its affiliation with this body, St. John’s Church has also taken part in major works of charity, supporting institutions of charity within the church and contributing liberally with its fellow congregations whenever an emergency arose among members of the household faith. It is understandable that a group as God-fearing and devout as the founders of St. John’s Church would not long be satisfied with only one service a month, particularly as their group continued to grow as the tremendous immigration movement of the mid-nineteenth century gathered momentum. They wanted, not only a service every Sunday, but also to have a pastor in their own midst. And so, in the year 1854, they addressed a call to candidate of theology, Anton Wagner, who had just graduated from the Theological Seminary of the Missouri Synod at Fort Wayne, Indiana. He accepted the call, and came to Watertown around the first of the year, 1855. At that time the railhead was extended to Oconomowoc, form where the young pastor traveled the remaining miles to Watertown by stagecoach. He arrived in the middle of the night, and found lodging in a hotel. The next morning, in spite of having contacted a severe cold on his journey, Candidate Wagner walked the six miles through snow a foot deep to the home of Rev. Geyer in town of Lebanon. Here he discovered that St. John’s Congregation had no “Agenda”, that is, the book of forms and prayers for church services, baptisms, the celebration of communion, the performing of weddings, and similar ministerial acts. The Missouri Synod had published no such book at that time. There remained nothing for him to do but to spend several days as the guest of Rev. Geyer, and copy the most important sections from Rev. Geyer’s book, which itself was also a handwritten copy. It might be well to note at this time that in those early years before the publication of hymnals by the Missouri Synod, the conducting of a church service involved considerable difficulty. The German immigrants had faithfully brought with them their copies of their hymnals, but since they came from different sections of Germany, the selection of hymns varied considerably, and the same hymn, although it often appeared in all the hymnals, nevertheless had different verses and was published in different dialects, all of which made congregational singing a problem. There frequently remained nothing for the pastor to do but to serve as cantor. He would sing the first line of a hymn and the congregation would repeat the line, whereupon the pastor would go on to the second line, which was repeated by the congregation, and so on through to the end of the hymn. Because of deep snow, Candidate Wagner’s ordination was postponed to Quinquagesima Sunday, Feb. 1, 1855. 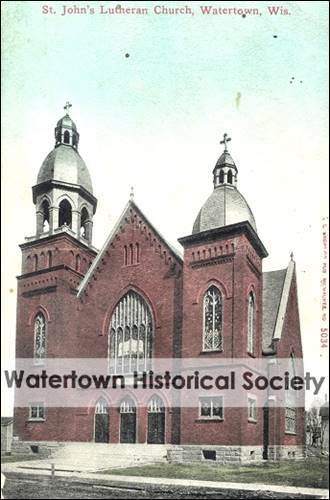 It took place in the largest hall in Watertown, located at Second and Main Streets, third floor and which was loaned to the congregation for this great event by it proprietor, John W. Cole. This hall and building is still in existence. The ordinator was Rev. O. Fuerbringer, president of the Northern District of the Missouri Synod, assisted by Rev. Fleischmann, and Rev. Geyer. It was well that the Lord had provided this infant congregation in virgin territory with a pastor full of enthusiasm and physical stamina, for there was a great deal of work to be done. Already in 1854, the congregation had begun the construction of its first house of worship, a frame building 40 x 26 feet, located, as closely as can be determined, at the intersection of Vine and Lynn streets. The deed for the property was turned over to the congregation on Jan. 11, 1855. The walls and roof of the building had been completed before the winter set in, but construction was suspended for the winter. In the meantime, the services of the congregation were still being held in the little public school building at North Fourth & Division Streets. At this time the congregation experienced a wonderful blessing. An accident, however, made the congregation realize the need for its own house of worship. It must have been at one of the first communion services at which Rev. Wagner officiated after his ordination, the floor of the building suddenly dropped several feet. Panic followed, and the entire congregation, with the exception of Rev. Wagner and several of the elders, fled the building. After the dust had settled, the congregation returned, and the service was resumed, although one can imagine how much on edge the members must have been, fearing a further accident. The service was concluded without incident, but on the next day it was discovered that the main beam supporting the floor had broken, and that the joists resting on the beam had very nearly been pulled from the walls. Even after many years, Rev Wagner frequently remarked how wonderfully the Lord had protected the congregation, in that no injuries or deaths had resulted from this accident. The accident, together with the rapid influx of German immigrants who came to the congregation as members, moved Rev. Wagner to urge the early completion of the new church. On the Fourth Sunday in Lent, Laetare Sunday, 1855, he preached on the Gospel for that Sunday, (St. John 6, 1-15) the story of the Feeding of the Five Thousand. He pointed out that, as the Savior had provided a place for His miraculous meal, so the congregation had the duty to provide a place for hungry souls to be fed with the “Bread of Life”. The next day members of the congregation came, prepared for work, and in a few weeks it was possible to conduct services in the new building. It was not completely furnished at first. For some Sundays, Rev. Wagner officiated before an altar made of a table covered with a cloth, and preached his sermons while standing on a pew. But the altar and pulpit were also soon provided, so that it was possible to hold the dedication services on the day of John the Baptist, June 24, 1855. The congregation was honored on this memorable occasion by having as its speaker the president of the Missouri Synod, the Rev. Dr. Frederick Wyneken, who preached the sermon in the morning. In addition, an afternoon service was held at which another of the well-known personages in the early history of Lutheranism in the Midwest, Rev. Frederick Lochner of Milwaukee, preached the sermon. This little building served the congregation for ten ears as a house of worship, but was permitted to remain standing for many years thereafter as an auxiliary to the school and teacherage later built on that site, and is well remembered by some of St. John’s older members. Immediately after his ordination, Rev. Wagner took over the conduct of the parish school in which he was soon actively engaged. It can no longer be determined, where the classes were held, but from a description of the building one can see how determined the fathers of St. John’s Church were to carry out the command of the Lord to bring up their children in the nurture and admonition of the Lord in spite of humble and primitive surroundings. The building was a little hut made almost entirely of slabwood, the trimmings from a lumber mill. The walls were made of slabs struck into the ground: the roof was composed of the same material, and was anything but water tight. In the center of the room was an old stove, from which a metal stovepipe projected through the roof in lieu of a chimney. Such a condition was not permitted to exist very long, however. Approximately a year and a half after the dedication of the church, the congregation constructed, on the same plot of ground, a school building, which was also to serve as a parsonage and teacherage. This was the well known “old school”, which many of the older members of St. John’s Church attended, which served as a school until 1885, and was subsequently converted into a teacherage and used for the purpose until 1929, when it was sold. The building located at 808 Vine Street, is still standing, and is still being used as a private dwelling. The property was sold by the congregation on Oct. 14, 1931. Concurrently with the erection of the school building, the congregation called a teacher, Friedrich Hasz, who assumed his duties in 1857, and remained with the congregation until 1859. It was necessary that the pastor be relieved of the burden of teaching the school, since opportunities existed in great number in neighboring communities for the pastor to gather together the ever increasing numbers of German immigrants into congregations. This was particularly true in the neighborhood of Reeseville, in the town of Lowell, where there was a community made up largely of immigrants of Bavarian descent. Clergymen of various persuasions attempted to form a congregation in this area. One of the most successful was a non-confessional pastor from Watertown, Rev. C. Sans, who regularly held services on Sunday afternoons in a public school in this community. The Lutherans of the community, however, felt dissatisfied with his avoidance of any clear cut statement on the Bible doctrine, and asked Rev. Wagner to serve them. In order to be absolutely neutral, the board of the public school decided that the pastor who arrived first could conduct the services in the public school on that day. Naturally, the trips to the town of Lowell frequently amounted to a race. The pastor would drive or ride horseback to the shore of Mud Lake, where he would be met by one of the members in a row boat. It frequently happened, of course, that Rev. Wagner would arrive later than Rev. Sans. Then the Lutherans would leave the school house and go to the home of one of the neighbors. Several pieces of fire wood would be taken into the kitchen, planks laid across, and the improvised church was ready. Toward the end of his ministry at Watertown, Rev. Wagner was instrumental in forming this nucleus into a congregation. It was in 1858 that Trinity Church of the Town of Lowell was organized. It was served by the pastors of St. John’s Church, Rev. Wagner and Rev. C. J. A. Strasen, until 1865, when it called is first resident pastor. Rev. Wagner also preached occasionally in the vicinity of Ixonia in the home of Mr. Keup, no doubt, laying the groundwork for the unique Lutheran school district which was organized later, and gaining many families for the cause of conservative Lutheranism. The infant congregation under the blessing of God and due to the phenomenal influx of immigrants grew amazingly in a short time. 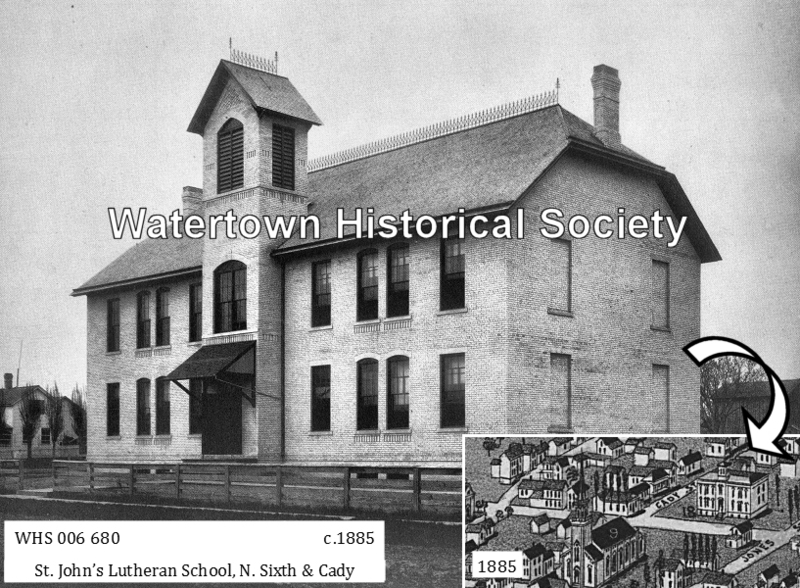 In 1853 Watertown was a city of 4,000 inhabitants, the second largest city in Wisconsin. By 1855 the population had doubled. A good proportion of the immigrants were of German origin, and many of these were Lutheran. It is understandable, therefore, that by 1857, only five years after its organization, St. John’s Church was a congregation of 90 voting members and 381 souls. Not all the experiences within the congregation were happy, however, perhaps due to the fact that the membership of the congregation was drawn from Lutheran immigrant from various sections of Germany, where customs differed. A controversy arose in 1857 in St. John’s Church as well as in the congregation at Lebanon. The custom of private confession before communion, which many of the older Lutheran liturgies still recognize as good Lutheran order, was followed. A group of the members, however, under the leadership of the first teacher of the congregation, Friederich Hasz, opposed this custom, at first privately, without the knowledge of the pastor. When finally the matter was brought into the open, and in spite of the fact that in deference to the objecting faction the equally correct custom of using the form of general confession was introduced as an optional practice, 20 families left the congregation. While this constituted a serious loss to the congregation, it was quickly recovered; so that only a year later the voting membership had once again risen to 96. Rev. Wagner, who had served the congregation for four years, received a call from Trinity Church, Fristadt, Wis., late in 1858, and being convinced that the Lord was calling him to a different field of service, left Watertown with the reluctant approval of the congregation, and was installed in his new charge on Jan. 16, 1859. 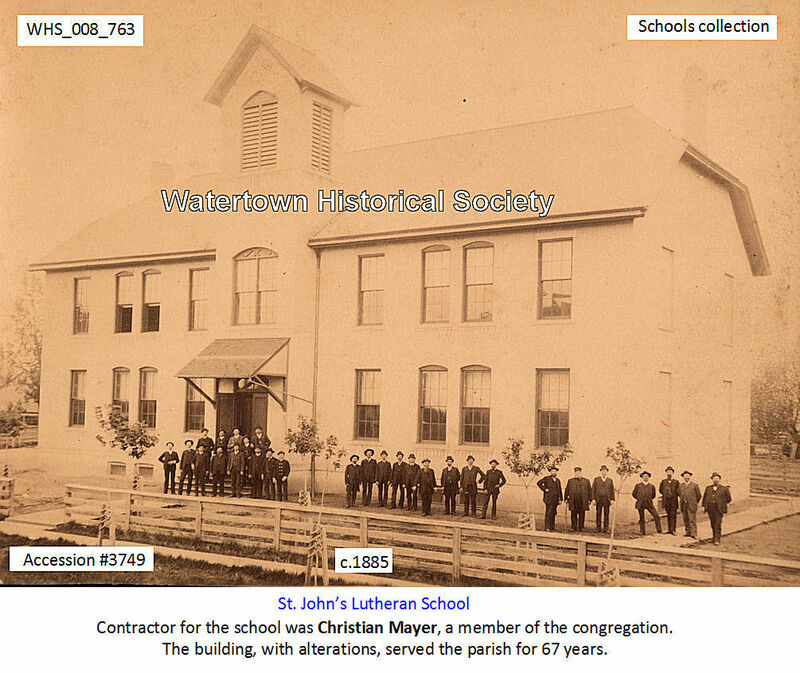 Such, under God, were the beginnings of St. John’s Lutheran Church, the first orthodox Lutheran Church in Watertown. The first seven years the congregation had become a sizeable group; it had founded a school; purchased property; built a church and school; called a pastor and a teacher; and undertaken missionary activities in the surrounding communities and affiliated itself with the Missouri Synod. It is with deep gratitude to God and to the fathers of St. John’s Church that we can look back upon these early efforts, which laid the groundwork for the century of Gospel preaching which St. John’s is permitted to celebrate, which had brought peace of conscience and the assurance of salvation through the merits of the Blessed Savior to thousands of blood-bought souls. St. John’s Church in Watertown had its beginning in 1852. The first new church building dedication followed on June 25, 1865, at the corner of North Fifth and Cady Streets. The cost of that structure was estimated at $15,000, a very large sum in those days. 06 16 Prof. E. C. Gaebler is putting up in St. John’s Lutheran Church a magnificent pipe organ manufactured at his Temple of Music, Fourth Street. His organ is a fine specimen of Watertown manufacture and reflects credit on its builder. A brief description of the instrument may be interesting. The organ has two banks of keys, two octave of pedals, and contains over fourteen hundred pipes from 16 feet to 3/4 of an inch in length. There are 28 stops and combination pedals. The case is 15 X 14 feet and 20 feet high. There are 28 gilded pipes in front, the largest of which is ten feet long and 6 inches in diameter. The bellows furnishes 35,000 inches of wind every second. The organ when completed is worth $5,000. Excellent workmanship has been displayed on all portions of the instrument. The design of the front was drawn by Mr. L. Charboneau and, of course, is tasty and artistic. The gilding and painting on the organ was done by Messrs. Degenhardt & Bradow, Mr. W. E. Dervin having a hand in on the finishing touches. Of course the tone of this instrument will be of the highest order, having passed through the hands of Prof. Gaebler, one of the foremost musicians of the state, who has supervised every portion of the work. Torn down in 1908 to make way for the present church edifice. Recognizing that the brick building erected for school purposes in 1868 was not adequate the congregation began to plan to build a larger school in 1881 on the corner at North Sixth and Cady. Construction was delayed until March, 1885. Contractor for the school was Christian Mayer, a member of the congregation. The building, with alterations, served the parish for 67 years. The confirmation services at St. John’s Lutheran church last Sunday were largely attended. The commodious church has a seating capacity of about 500 people, and every available seat was taken, after which chairs were pressed into service and this proving inadequate to the demand of these zealous and interesting people. The church was beautifully decorated with huge palms and the altar was embellished with handsome urns filled with cut flowers, which were very pleasing to the eyes of The congregation. Rev. F. H. Eggers, pastor of the church, delivered an eloquent sermon, and a large class was confirmed. The children demonstrated the result of much earnest labor and also the strict attention that had been given them by their pastor during their term in the parochial school which was greatly appreciated by their parents. Special music was rendered. The girls were beautifully gowned in white and the boys carried bouquets of carnations. Those included in the class were: Herman Hofs, Willie Baumann, Bernard Schmidt, Reinhold Borth, Waldemer Bunding, Willie Luther, Emil Henning, John Seefeldt, Hugo Gutzlapf. Arthur Fetzlapf, George Gotterdam, Elmer Kohn, Willie Fischer, Willie Schut, Max Maede. Lydia Mittag, Meta Krahn, Irma Nickels, Else Beerbaum, Aldina Nickels, Minnie Wolf, Lydia Bittner, Ella Schlieve and Else Christian. The entertainment given last evening at St. John's Lutheran Church by children from the Home of the Feeble-Minded was marvelous in the extreme. It demonstrated that wonderful mental improvement was being accomplished with the feeble-minded children at the Home and also proves the value of its work. Thirty-five of the children were present at the exercises which were deeply interesting and if anyone was skeptical when they went they were convinced when the exercises were over that the mental and physical condition of the unfortunate was being greatly improved. The church was packed from vestibule to altar and the galleries were crowded with interested people and many were unable to gain admission. Prof. Schumacher presided at the organ and Rev. H. Eggers had charge of the liturgy and Rev. J. Klingmann delivered an address in which he spoke feelingly of the work being done in behalf of the children — the efforts to bring them to the Savior, that they might know and love him. "As ye did it unto the least of these, ye did it unto me." The answers of the children were clear and distinct and the singing especially fine, a beautiful Christmas tree was put up by a committee of St. John's congregation upon which, there was a box of candy contributed by Mrs. Lewis Junior. The collection taken up for the benefit of the home amounted to $70. 01 03 The year 1907 promises to be a good year in the way of building and improvements. Among the contemplated buildings are a new and modem church to be erected by the congregation of St. John’s Lutheran Church on North Fifth Street. The new edifice, it is said, will cost in the neighborhood of $35,000 and will be of pressed brick. The capacity is to be about 1,000. The church will have a gallery, steam heat and toilet rooms. 01 20 At a meeting of the congregation of St. John's Lutheran Church on Sunday, it was definitely decided to carry out the plan to erect a new church edifice at a cost of about $30,000, plans for which were drawn about a year ago by Architect F. A. Lindsay. This will be one of several notable improvements that are promised Watertown for the present year, another writer having in mind the new M. E. church, which is to be erected of concrete blocks at a cost of $10,000 or $12,000. It is the plan of the St. John's church people to begin building operations just as soon as possible. A meeting of the building committee will be held tomorrow evening to perfect plans for the preliminary work, and arrange for the commencement of operations in calling for bids. The new building will be erected on North Sixth Street. According to the plans as drawn by Mr. Lindsay, the church auditorium is to be 58x76 feet, with a seating capacity of 700, while a gallery is provided for with a seating capacity of 300, making a total seating capacity of 1,000. Judging from the plans, the new church will be an imposing structure. It is to be erected of red pressed brick, with a slate roof. The interior finishing will be handsome and is to be of oak. The fixtures will be in keeping with the other appointments and when completed the St. John's congregation will have a house of worship of which they can feel proud and the city another ornament. 02 14 The Young Ladies Society, together with the Young Men Society of St. John’s Ev. Luth. Church, celebrated their anniversary at the school hall last Sunday evening. An elaborate supper was served, covers having been laid for fifty. The feast was followed by music and games and several guessing contests: First prizes were awarded to Misses Emma Doering, Selma Meyer, Messrs. Frank Uttech and John Seefeldt. The regular services at St. John’s Lutheran Church last evening (Sunday) were in the nature of a farewell, it being the last to be held in the old church. Work of razing the same will be commenced today to give place for the erection of a beautiful new edifice at a cost of about $32,000, the plans for which were drawn about a year ago by Architect F. A. Lindsay. This is to be one of the many improvements promised for Watertown this year, another being the erection of a new Methodist church at a cost of about $12,000. The new St. John’s church will be erected on North Sixth Street. According to the plans as drawn the church auditorium is to be 58x76 feet, with a seating capacity of 700, while a gallery is provided for with a seating capacity of 300, making a total seating capacity of 1,000. It is to be erected of red pressed brick, with a slate roof. The interior finishing will be handsome and is to be of oak. The fixtures will be in keeping with the other appointments and when completed the St. John’s congregation will have a house of worship of which they can feel proud and the city another ornament. A sight that was watched with interest by a large number of spectators was that of the razing of the steeple of St. John's Lutheran Church, which occurred yesterday morning under the supervision of John Diehl. 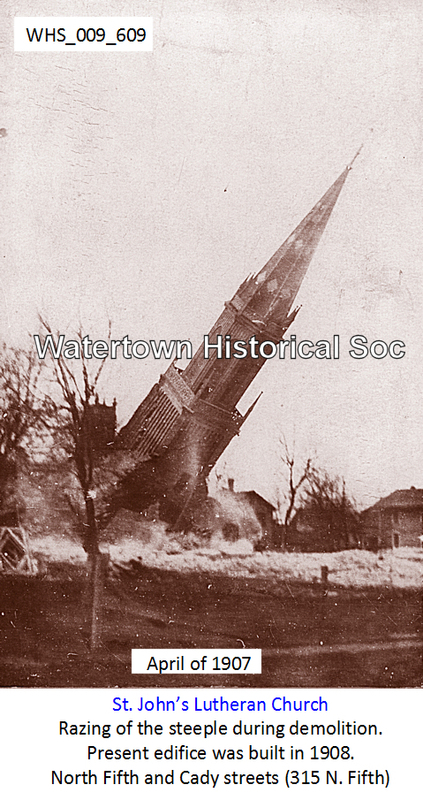 The sight of the lowering of the steeple, which was 150 feet in height, was a novel one. The job was nicely engineered and was completed without any mishap. Jacks were used, also a cable attached to a windlass. The balance of the church has been razed to give place to a new edifice, work upon which will soon be commenced. 06 30 St. John's German Lutheran church is one of the oldest churches in Watertown and probably in the state. It was organized in 1852 . . . The foundation of the congregation was laid by the Rev. Louis Geyer, who lived eight miles northeast of Watertown. Rev. Geyer visited the small congregation for a few years, when in 1855 a resident minister was called. Rev. H. Wagner became, in the fall of 1855, the first permanent pastor of St. John's church. The services during Rev. Wagner's pastorate, were held in a small frame building in the Sixth ward. In 1859, Rev. C. Strasen succeeded Rev. Wagner. Rev. C. Strasen's work at the St. John's church was crowned with great success. He occupied his position for over forty years and until seven years ago he was pastor of the church when he retired owing to old age. Since 1900 the Rev. H. Eggers has acted as pastor of the church, a minister known for his conscientious work. The new church is expected to be completed by Christmas time . . .
New St. John’s Church, Gamm Drug Store postcard. Early in 1907 it was decided to build a new and larger church to meet the growth of the congregation. 01 02 Yesterday afternoon while Rev. F. H. Eggers was out driving, his horse became frightened near the plant of the Dornfeld-Kunert Co. on South Second Street and ran away and made it exceedingly lively for Mr. Eggers, who fortunately escaped without injury, much to the gratification of his many friends. The horse, which was injured to some extent, was sent to the hospital of Dr. A. H. Hartwig for examination, and if necessary, treatment. 04 05 On April 5, 1908, the construction was finally completed, and with great rejoicing the congregation was able to dedicate its new house of worship. Dedication services were held in German and English. The church was built at a cost of about $45,000 in a Roman style of architecture. The roof is covered in slate shingles. The foundations are of Portwing red sandstone, and the remainder of the church is built of St. Louis hydraulic red brick. 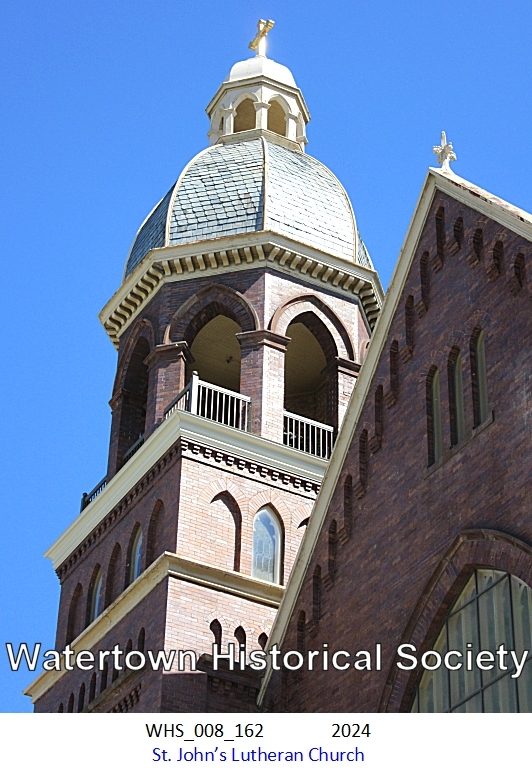 The north steeple, the higher of the building’s two towers, extends 112 feet in the air, and contains three large bells which were saved from the earlier church building. The main sanctuary of the church could seat 800 individuals, and at that time, the balcony could seat 375. A new pipe organ was installed at a cost of $4,650. 05 24 Ladies Aid Society was organized May 24, 1918 with 47 members. Late in 1947 the Rev. F. H. Eggers, whom the Lord had preserved for so long a time and had permitted to serve St. John's Church for 47 years, became ill. It soon became evident that he would no longer be able to fulfill his duties, and so on November 1, 1947; he offered his resignation to the congregation, which was accepted with regret. For several months Pastor Eggers made his home with one of his sons, the Rev. Theodore Eggers, Chaplain of Bethesda Lutheran Home, where he died on May 19, 1948, at the age of 78 years. His funeral was held on May 23 in St. John's Church, where a large gathering of his sorrowing parishioners heard the Rev. Karl Wedel, Circuit Visitor, deliver the funeral sermon. His body, like that of Pastor Strasen, was laid to rest in the Lutheran Cemetery, where with a great number of his former parishioners it awaits the Resurrection Morn. In this manner, according to the will of God, ended the life and the career of the third resident pastor of St. John's Lutheran Church. In his tenure of office, Pastor Eggers had seen the congregation grow into a church of considerable size. His talents had often been put to use in the service of the Missouri Synod, on whose boards and committees he served. He also rendered a very great service to Bethesda Lutheran Home, being a member of the original board which called the Home into existence. He also was partly responsible for its location in Watertown, and served as Chairman of the Board for a great many years. The congregation will long remember the many loving services it received at the hands of Pastor Eggers. It will always find a reason to thank the Lord for having sent it a man of such capabilities and talents, and for having permitted him to remain as its leader for so long a time. St. John’s Lutheran Congregation in Watertown, a member of the Missouri Synod, this year is observing its 100th anniversary and the centennial will be celebrated on the four Sundays in October. There will be outstanding guest speakers. A display of crosses has been placed in the church, starting with the founding of the church in 1852. A cross is added each month representing another decade of progress until the entire display of eleven crosses is completed in October. In the center of this display is the Luther Rose, which was the official seal of Dr. Martin Luther. At the bottom of the display are the words, “Through a Century with Christ”. 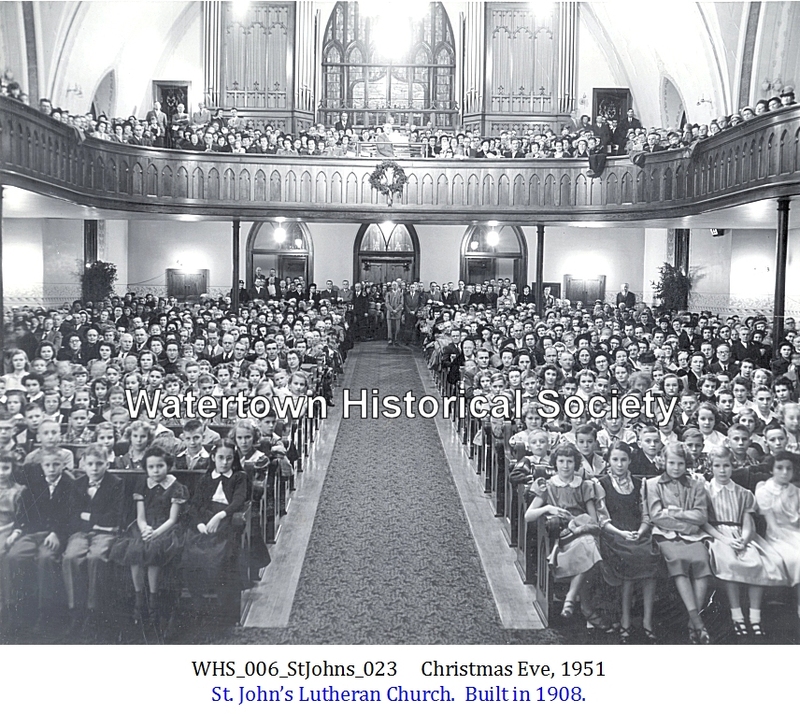 St. John’s congregation and its members played an important part in the growth and development in the city of Watertown and the surrounding area. It not only founded this church, but helped in the founding and development of other churches in the surrounding communities. Work has begun on the demolition of St. John's Lutheran School to make way for a new and modern structure which will be undertaken shortly. The old building has served St. John's congregation for the past 69 years. It was erected in 1885 and several generations of children have attended its classes. The school which is to replace it will be a modern structure, utilizing considerable glass and will embody many of the latest features. The architect is Alfred Siewert of Milwaukee. The new school will front on North Sixth Street, between Cady and Jones streets. It will occupy a much larger site than did the old structure, since additional space (the former Wendt home and property on Cady Street and the Zimmermann home and property on Jones Street), were acquired by the parish for school campus purposes. The old properties have been cleared away to make room for the new school. Groundbreaking ceremonies will be held at the site by the congregation Sunday morning. Classes in St. John's School are being conducted in the city's old Webster School in Western Avenue during the interval of construction. 01 09 Final details were being arranged today for the dedication on Sunday of the new school erected by St. John's on the site of the old school building in North Sixth Street between Cady and Jones Streets. There will be three dedication services at the church, directly across the street from the new school. The school, which has a current enrollment of 270, will open Monday morning. The new $360,000 school was designed by Alfred H. Siewert, well known school architect. The general contractor was the firm of Fred Piette and Sons, Appleton. 12 16 The voters’ assembly of St. John’s Lutheran Church elected 1965 officers last night. Elected were, H. M. Stoeppelwerth, president; Herbert Lehmann, vice president; Ray Dobbratz, trustee; and Mel Scheid, member of the board of education. The following were elected to the board of elders: Marvin Kaufmann, District No. 1; Robert Wheeler, District No. 2; Howard Herold, District No. 4; Gerhardt Doehler, District No. 11. St. John's Lutheran Church will hold a service of recognition Sunday to honor Herbert Richter, principal of St. John's School, for his 25 years of service as a teacher in the Lutheran Church -- Missouri Synod. The service will be at 9 a.m. Mr. Richter has served as a teacher and principal of St. John's School since 1961. His other teaching service was spent in other areas. The Rev. C. F. Golisch, the executive director of Bethesda Lutheran Home, will be the speaker at the service. Members of St. John's Lutheran Church turned out Sunday to honor the senior pastor of their congregation, the Rev. Eugene C. Gunther on the occasion of his silver jubilee as a minister. Pastor Gunther assumed the pastorate in Watertown on Aug. 18, 1963. A feature of the celebration yesterday was a "This is Your Life" program which was held in St. John's School gymnasium at 2 p.m. and which came as a complete surprise to the pastor and which brought out many of the highlights of his life and his career as a minister. He enjoyed it thoroughly and so did the program participants and the huge audience on hand for the event. The jubilee service was held in the church at 3:30 p.m., beginning with an organ prelude, a processional and vespers. The choir also took part in the service and there also were hymns. The anniversary sermon was delivered by the Rev. John W. Meyer of St. Paul's Lutheran Church, Mattoon, IL. The liturgist was the Rev. Eugene P. Kauffeld, associate pastor of St. John's Church. Herbert Richter was the organist and Albert Dede directed the choir. Pastor Gunther is a native of St. Joseph, Mich., where he was born Nov. 6, 1910. He received his elementary, high school, and junior college education in Grand Rapids, Mich. From there he moved with his parents to High Point, N. C.
In 1932 he enrolled at Concordia Seminary, Springfield, IL. He graduated in June of 1938. Because of the shortage of calls, he spent the next several years working in a mill, canvassing for the Central Illinois District in the oil fields around Salem, and teaching school at Arenzville, III, and Corunna, Ind. On March 8, 1942, he was ordained and installed as pastor of Zion Lutheran Congregation, West Fairfield, Corunna, Ind. He served that parish until May of 1952 at which time he became pastor of Immanuel Lutheran Church, Mt. Olive, IL. During his pastorate there he also served as chairman of the Southern Illinois District Welfare Committee, as a member of the board of directors of the Lutheran Child Welfare Association of Illinois, as a member of synod's committee on service to the aging, as a delegate appointed by the governor to the White House Conference for the Aging, and as zone pastoral advisor to the LLL and LWML. He was also active in the County Association for the Mentally Retarded. Pastor Gunther was married to Gertrude Wenger of Springfield, IL., on Nov. 20, 1941. They are the parents of one son, John, and three daughters, Gail, Mary, and Hope. Pastor Gunther received many messages of congratulation yesterday and during the program in the school he and Mrs. Gunther were presented with a gift by the congregation in the form of a savings account. St. John’s Lutheran Church, of which the Rev. Eugene Gunther and the Rev. Eugene Kauffeld are pastors, today made public plans for a vast remodeling program of the church edifice. The preliminary cost estimate for the project runs to $300,000. Under present plans, bids are expected to be called for with completion of the working drawings sometime in July, with the bids to be opened in August and with construction to start late in August. The construction is to include a new front entrance, new exit stairs, remodeling the nave, balcony and chancel. Included also are an insulated ceiling, painting and decorating, a new lighting and sound system, new carpeting, new pews, a new heating system, remodeling the basement, and an addition to the east. On Thursday evening, June 8, at 7:30 o’clock 40 class members of St. John’s School eighth grade will receive their diplomas. The graduation ceremony will be held at St. John’s Lutheran Church during a special worship service arranged for the evening. The festival speaker for the occasion is the Rev. Eugene Kauffeld, associate pastor of St. John’s. The junior choir, under direction of Albert Dede, will offer the worship anthem. Miss Viola Schlueter will be the organist. Chosen to offer the salutatory and valedictory are two honor students of the class, Christine Grosnick and Gary Sullivan. The class members will be presented to the congregation by Principal Herbert Richter. Mel Scheid, chairman of the St. John’s board of education, will present the diplomas. On Pentecost Sunday of this year the members of the class were accepted into communicant membership of St. John’s through the rite of confirmation. They received their first communion on this Sunday. A number of the class are actively involved in parish activities including Sunday school, Walther League, as well as the vacation Bible school beginning on June 12. Several male members are active in local Scout troops. Pamela Baumann, Roxanne Buss, Dan Casperson, Richard Ebert, Marcia Eggers, Code Erdmann, James Griep, Christine Grosnick, Gary Guetzlaff, Cynthia Hilgendorf, Frederick Hasten, Geoffrey Kaufmann, Dorrie Kienast, Sheryl Kohlhoff, Steven Kohlhoff, Kent Kowalske, Dennis Lange, David Lauersdorf, Romana Lidmilla, Norman Lorenz, Faye Maas, Craig Otto, Thomas Reason, Gary Schliewe, Edward Schmidt, Daniel Schmoldt, Darlene Schmoldt, Richard Schmoldt, Diane Stueber, Karen Stueber, Gary Sullivan, Allan Uttech, Christine Wagner, Jane Warner, Linda Wendt, Steven West, Lori Wickus, James Wiley, Max Wincell, Bonnie Zastrow. St. John’s Lutheran Church today announced the awarding of contracts for the major reconstruction and remodeling project to be carried out at the church edifice, with work expected to start almost immediately. Plans for the program were originally made public some months ago. St. John’s is presently organizing a special building and remodeling fund program. Men and women of the church are being trained and prepared for the every member visits which will begin on Sunday, Oct. 1. The Rev. Eugene Gunther, senior pastor of St. John's Lutheran Church, has accepted a call to become the secretary for district and parish activities for the Board of Social Ministeries of the Lutheran church, Missouri Synod. His duties will be to sensitize and counsel the welfare committees and boards of the Synodical districts so as to facilitate the fulfillment of their mission in and through the congregations of the respective districts; to motivate, sensitize and equip individual Christians, congregations and pastors so that they might address themselves to the needs of their neighbor with increasing competence and consecration. Pastor Gunther is to assist in the conduction of welfare needs and opportunities and to be knowledgeable in public welfare plans, proposals and programs and alert Congregational Welfare Committees through the district with information and possibilities of participation, and to assist in the direction and supervision of the committees involved in the Board of Social Ministry. Pastor Gunther has long been active and interested in welfare and social work before coming work and before coming to Watertown served as chairman of Mental Retardation survey committee and was a member of the board of directors of the Lutheran Service to the Aging. or many years he served as chairman of the Southern Illinois District Social Welfare committee, and was also a member of the board of directors of the Lutheran Child Welfare Association of Illinois. One of his special assignments was that of a member of the governor's delegation to the White House Conference on the Aging. On Sunday, Jan. 14, Pastor Gunther will preach his farewell sermon at St. John's Lutheran Church. He stated that he has enjoyed his ministry in Watertown and has made many lasting friendships which he will treasure over the years. His office will be located in the Lutheran building in St. Louis. The next renovation/building program did not take place until 1968. The interior of the church was completely modernized with the balcony wings removed to uncover the large stained–glass windows. The interior was greatly changed from the original ornate and Gothic furnishings to a very plain nave and chancel. The free-standing altar and baptismal font, as well as the tops of the pulpit and lectern, were covered with Travertine marble. A wing was built onto the east end (Sixth Street) of the church containing the sacristies, two pastor’s offices, the church business office, a reception area, the council chamber, restrooms, and an east and west entrance. In the front of the church an addition covered the front steps and contained a chapel, restrooms, and north and south entrances. In the basement there were 10 Sunday school rooms, an altar, fellowship hall, kitchen and restrooms. The Rev. Eugene P. Kauffeld was installed as senior pastor of St. John's Lutheran Church during a service held in the church Sunday afternoon. Pastor Eugene Gunther, former senior pastor of the church, is now secretary for district and parish activities for the Board of Social Ministries of the Lutheran Church, Missouri Synod. The liturgist at the installation services was Rev. Donald Nordmeyer and the installing pastor was Rev. Herbert W. Baxmann, president of the Wisconsin District of the Lutheran Church, Missouri Synod. Rev. Gerhard W. Zuberbier of Sullivan, counsilor of Circuit 19 preached the sermon based on Mathew 14, verse 52 — "Therefore every scribe which is instructed unto the kingdom of heaven is like unto a man that is a householder, which bringeth forth out of his treasures things new and old". Herbert Richter was the organist. A reception followed immediately after the service in the school cafeteria where coffee and cookies were served by Mesdames Ralph Christian, Armin Zastrow and Howard Herold. The Rev. Theodore E. Gundlach, newly named associate pastor of St. John's Lutheran Church, will be installed on Sunday afternoon, April 7 at 2 o'clock, according to announcement made today. Pastor Gundlach, who is 34, eldest son of Mr. and Mrs. R. A. Gundlach, graduated from Mt. Calvary Lutheran School, Milwaukee in 1948 and from Concordia High School there in 1952. Two years later he graduated from Concordia Junior College, Milwaukee. After attending Concordia Seminary in St. Louis one year he transferred to River Forest, Ill., where he graduated in 1957. Having a desire to enter the ministry, he applied for entrance into the ministerium of the Missouri Synod through colloquy. By taking courses in summers, the requirements were met and he was ordained in September of 1965. Pastor Gundlach taught at Walther Lutheran High School from 1957-1960, and at Milwaukee Lutheran High School from 1960 till the present time. He held congregational offices at Zion Lutheran Church in Illinois and Mt. Calvary, Milwaukee. He has served as chairman of the Milwaukee Lutheran High School faculty and of the Wisconsin - Illinois Lutheran Teachers Association. Since his ordination in 1965, Pastor Gundlach has served as pulpit assistant at Nazareth Lutheran Church, Milwaukee. In addition, Pastor Gundlach has also served as pulpit assistant at Benediction Luthean Church, Milwaukee, since April of 1966. On July 27, 1957 he was united in married to Jane Elizabeth Herbst. God has blessed the marriage with five children, Timothy, Daniel, Diane, Jonathan, and Sarah. Members of St. John's Lutheran Church are looking forward to Sunday, Oct. 6, the day that has been set aside for the dedication of what is practically a reconstructed church, work on which began just a year ago and is now completed, except for a few minor details here and there. The huge task -- and it was a major one -- has been successfully and beautifully carried out. The architects, Durrant, Dondlinger, Dommer, Kramer and Gordon, have turned in a magnificent job. From the entrance to the church, in North Fifth Street, which has been entirely transformed, down to the most minute detail, they have given the congregation an edifice that is complete for modern day needs. Good Shepherd Lutheran Church sprouted shortly after members of St. John's Lutheran Church voted to sever its affiliation with the Lutheran Church-Missouri Synod, on Aug. 30, 1971. Officials of the South Wisconsin District of the synod immediately began discussing the possibility of establishing a mission congregation. 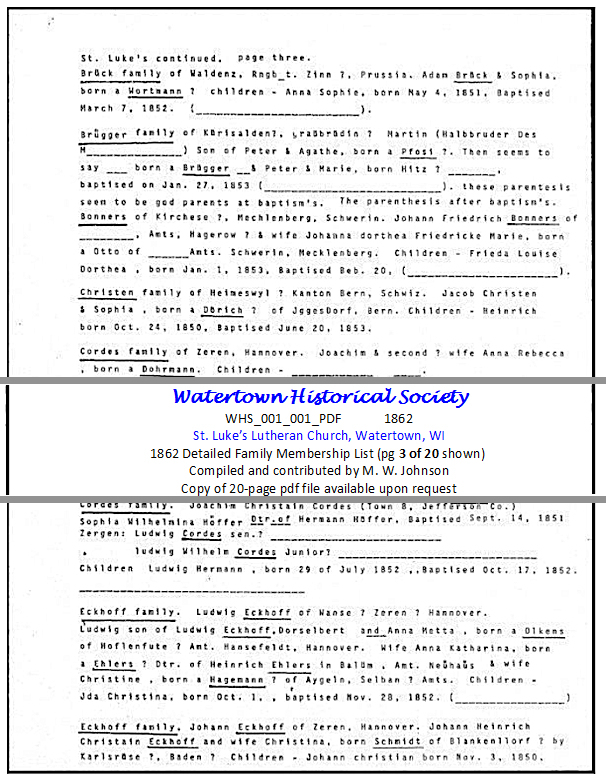 A meeting was held Sept. 22, 1971, for individuals interested in forming a new Lutheran congregation in Watertown. One hundred and sixty-three signed a register that night indicating interest in a new church. On Aug. 30, 1971, congregational voters met in the church and voted to leave the Missouri Synod. This ended an association with Missouri Synod which had lasted 117 years. 06 09 On June 9, 1975, St. John’s voted to apply for membership in the Wisconsin Evangelical Lutheran Synod (WELS). The congregation together with its pastors and teachers were accepted into the WELS in August 1975. 09 18 Another renovation of the interior of the church and dedication was held Sept. 18, 1988. The studios of Potente were selected as the architect for the renovation project. The original Gothic interior was restored with the soft colors and design painting. The central focal point was the 17-foot linden wood cross and carved figure of the ascending and blessing Christ on the center wall of the chancel. This cross and figure of Christ were carved in a small woodcarving shop in Italy. The front narthex has been repainted and the golden altar missal stand refinished. A special 100th anniversary banner has been constructed and will hang in the church. St. John’s Lutheran Church will conclude its month-long 140th anniversary celebration with three festival services on Sunday, Reformation Day. Services are planned at 7:15, 9 and 10:30. The special emphasis for the day is on the organizations of the church and the service of its members. Parishioners and guests are encouraged to stop at the new display case in the entrance of the church to view the pictures showing past and present organizations of the church. Preservice music will be played by the handbell choir and special music will be offered by the three church choirs during the services. The youth league will serve a potluck dinner at noon in the school cafeteria. Following the meal, Ruth Feld will give a slide program on the history of St. John’s Lutheran Church. The congregation and friends of the church are invited to share in this time of remembering. St. John’s Lutheran Church was formed in the summer of 1851, when a group of emigrants from Pomerania in northeast Germany made their way to Watertown, a thriving community of 4,000 people. Under the leadership of Heinrich Kroening, the group rented a small public school building in the neighborhood of North Fourth ad Division streets. There was no pastor so a member would read the sermon each Sunday from a book of Lutheran sermons. The congregation called its first pastor, the Rev. A. Kleinegees, in 1852. He and Kroening also served as teachers. 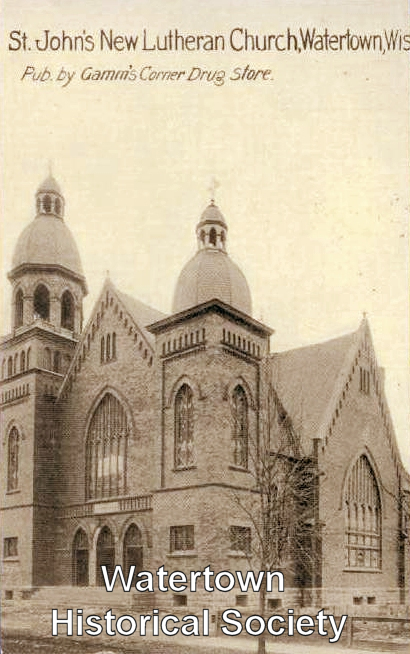 The construction of the first house of worship began in 1854 and was located at the intersection of Vine and Lynn Streets. A school was later built to the south on the same lot. This building is currently being used as a private home. The Rev. C. J. A. Strasen was installed as pastor of the congregation on July 31, 1859, a position he held for 41 years. During that time, a new and larger church was constructed on the corner of South Fifth and Cady streets at a cost of $15,000. Dedication services were held June 25, 1865. The new school building was construction on the corner of South Sixth and Cady streets in 1885, with F. W. A. Fuerstenau as teacher for 37 years. F. H. Meyer was called as the second teacher in the 1868 and served for 40 years. In less than 50 years, the congregation grew to 1,600 members, making a larger church necessary. The demolition of the existing church began April 2, 1907 and the dedication of the completed new structure took place on April 5, 1908. N This new building, the present church, can accommodate approximately 800 people and was built at a cost of $45,000. The Rev. F. H. Eggers was pastor of the congregation and served St. John’s for 47 years. The oldest organization in the church, the Mixed Choir, was formed in 1908 and the ladies aid society was organized May 24, 1918 with 47 members. The school received necessary changes in 1911. Construction of the present school began in 1954, with dedication services in 1956. In 1987, the school received an extensive facelift, replacing the glass-block walls with more energy efficient material and remodeling the office area. A parish hall was built in 1926 and is still in use today. Two major church renovation projects were carried out by the congregation. The first project in 1967 saw the removal of much of the original balcony, installation of a new pulpit and altar, enlargement of the narthex, completion of the basement and an addition to the office area. The 1988 renovation was chiefly a redecorating project, with painting, installation of new carpeting, a lectern, modified lighting, and the erection of the Ascending Christ behind the altar. St. John’s left the Missouri Synod in 1971 for doctrinal reasons, ending a 117-year association with the synod. The congregation became a member of the Federation for Authentic Lutheranism (FAL), an interim synodical body. On July 9, 1975 the congregation voted to apply for membership in the Wisconsin Evangelical Lutheran Synod (WELS). St. John’s congregation supports a school with nine full time teachers, two part time teachers, and a principal. Classes are held for children in preschool through eighth grade. The Rev. E. P. Kauffeld and newly installed associate pastor, the Rev. John Boehringer, serve St. John’s. 11 12 The beautiful sound of handbells at St. John's Lutheran Church has reached a more resounding ring with the addition of two more octaves. The adult handbell choir will make its five-octave debut on Sunday, Nov. 14, when members will be wearing new robes and performing at a longer line of padded tables. The original bells for the first three octaves have been refurbished, making them just as bright and sound worthy as their new counterparts . The enhanced sound means much more than increasing the number of bells from 37 to 61. Adding the two octaves shows the dedication of members and the growing interest in providing special music for the congregation. The 150th anniversary of St. John's Lutheran Church-WELS was celebrated with guest preachers and special activities throughout 2002. The theme of the anniversary celebration was "Children of God: Then, Now and Forever." A number of guest speakers were planned during the year. Several guest choirs will also provide special music during the celebration. A new pictorial directory was planned for church members and their families. Other activities included a historic display, commemorative Christmas ornaments, an anniversary video of the past 150 years, a congregational history book. A new pictorial directory was planned for church members and their families. Other activities included a historic display, commemorative Christmas ornaments, an anniversary video of the past 150 years, a congregational history book, and an anniversary dinner at Turner Hall on Oct. 13. St. John’s Church in Watertown had its beginning in 1852. The first new church building dedication followed on June 25, 1865, at the corner of North Fifth and Cady Streets. The cost of that structure was estimated at $15,000, a very large sum in those days. Early in 1907 it was decided to build a new and larger church to meet the growth of the congregation. On April 5, 1908, the construction was finally completed, and with great rejoicing the congregation was able to dedicate its new house of worship. Dedication services were held in German and English. Historical picture displays of the church may be viewed in the lower level of the church. Refreshments will be served. The public is welcome. St. John's Lutheran Church was formed in the summer of 1851, when a group of emigrants from Pomerania in northeast Germany made their way to Watertown, a thriving community of 4,000 people. Under the leadership of Heinrich Kroening, the group rented a small public school building in the neighborhood of North Fourth and Division streets. There was no pastor so a member would read the sermon each Sunday from a book of Lutheran sermons. The congregation called its first pastor, the Rev. A. Kleinegees, in 1852. He and Kroening also served as teachers. The Rev. C. J. A. Strasen was installed as pastor of the congregation on July 31, 1859, a position he held for 41 years. During that time, a new and larger church was constructed on the corner of South Fifth and Cady streets at a cost of $15,000. Dedication services were held June 25, 1865. The new school building was construction on the corner of South Sixth and Cady streets in 1885, with F. W. A. Fuerstenau as teacher for 37 years. F. H. Meyer was called as the second teacher in 1868 and served for 40 years. In less than 50 years, the congregation grew to 1,600 members, making a larger church necessary. The demolition of the existing church began April 2, 1907 and the dedication of the completed new structure took place on April 5, 1908. This new building, the present church, can accommodate approximately 800 people and was built at a cost of $45,000. The Rev. F. H. Eggers was pastor of the congregation and served St. John's for 47 years. St. John's left the Missouri Synod in 1971 for doctrinal reasons, ending a 117-year association with the synod. The congregation became a member of the Federation for Authentic Lutheranism (FAL), an interim synodical body. On July 9, 1975 the congregation voted to apply for membership in the Wisconsin Evangelical Lutheran Synod (WELS). St. John's congregation supports a school with nine full time teachers, two part time teachers, and a principal. Classes are held for children in preschool through eighth grade. The Rev. E. P. Kauffeld and newly installed associate pastor, the Rev. John Boehringer, serve St. John's.